Most beer available in Norway is a light coloured pils, or lager - but that changes in the weeks before Christmas, with many breweries producing special Christmas beers which are darker, heavier and sweeter. They are called Juleøl or Julebrygg in Norwegian and are designed to compliment the heavy, rich Christmas foods, like Pinnekjøtt and Ribbe. There are many types and strengths of Christmas beer, ranging from alcohol-free to strong (around 6.5%). The supermarkets can sell beer up to 4.7% (klass D) so if you want to try the fuller flavour of the stronger beers (klass F) then you have to go to the Vinmonopolet (often shortened to "polet") or government monopoly alcohol shops, where you have to buy wine and spirits in Norway. These shops are now mostly quite friendly, with a supermarket-style layout. The days of standing in line to order by number from a book are now almost gone. There are still some areas with strict controls on beer (I remember when you could only buy beer in the Ålesund area by pre-ordering it by the crate from a monopoly shop) and in most areas the beer in the shops "sleeps" in the evenings and weekends except Saturday morning. Get one or two bottles of different types - there are at least 20 to choose from - and see which ones you prefer. 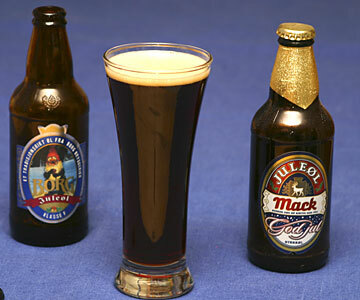 We think two of the best are from Mack (the world's most northerly brewery, in Tromsø) and Borg, but there are many others. Ribbe is Pork ribs roasted so that the fatty surface layer is crunchy. Other popular Christmas meals include Smalahove - half a sheeps head - and Lutefisk - Cod preserved in caustic soda which is really NOT my favorite. Turkey is also becoming fairly popular.